We are pleased to announce and welcome Joel D. Campbell MD, Adult Neurology to Texas Neurology Consultants! Welcome to Texas Neurology Consultants, LLP, a private practice founded on the principles of innovative neurological care combined with skill, extensive experience, and compassion. Drs. Shari Rosen-Schmidt, Charisse Barta, and Joel Campbell have been providing quality neurological care in Plano for a combined total of more than forty years. 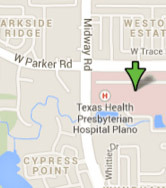 We are currently affiliated with Texas Health Presbyterian Hospital in Plano. As Neurologists, we serve as consultants to other Physicians in diagnosing and treating disorders of the nervous system, including diseases of the brain, spinal cord, nerves and muscles. We also provide long-term care to those patients with chronic neurological disorders. Our practice offers advanced diagnostic, therapeutic, and interventional procedures and treatments. We combine clinical services and expertise with state-of-the-art therapies. Some of the problems we diagnose and treat are stroke, epilepsy (seizures), headaches (migraines), dementias (Alzheimer's disease), multiple sclerosis, and Parkinson's disease. Since not all of the doctors treat the same diagnoses, please ask prior to scheduling.